Tiger Woods shot his second straight even-par 71 at the 147th Open Championship on Friday. Tiger went out with a 1-over 37 but came home in 1-under 34 on the tougher side of the course. He now sits at even-par 142 after two days of this Open, six back of the leaders at the time he finished. On a wet, cool day at Carnoustie, a variety of strategies were on the table during Round 2. Following the dried out conditions Thursday where tee balls were rolling out (literally) 100 yards, the same shots were checking up in front of bunkers and burns Friday. The difference was jarring. "It was a test, but I have to say the fairways were a lot easier to hit today," Woods said on Golf Channel. "They weren't as fiery. The ball wasn't traveling as far on the ground. We could get after some of these flags, which was nice. Yesterday was a little bit more defensive. Today we could be a little bit more offensive, which was nice." Some, like Rory McIlroy, opted to sit back and not get into trouble in the thicker, lusher rough or challenge the penal bunkers. Others, like Woods, chose to turn the aggressiveness up a notch early on. It got him into trouble. Woods hit driver at Nos. 2 and 6 and found the heavy stuff on both holes. He bogeyed No. 2 and nearly decapitated a gaggle of fans in doing so. A three-putt bogey on the third, and it looked as if it might spiral. He righted the ship, though, with healthy birdie putts at Nos. 3 and 4. The second one was from distance. Tiger went on to make par at the par-5 sixth I noted earlier but didn't, as he said on Thursday, "take care of" one of the two par 5s on the course. His frustrating front nine in weather that proved to be a nuisance ended with a bogey at the par-4 9th hole. The back nine was much cleaner, even as Woods dialed it back. He was precise with his approach shots and was rewarded with birds at Nos. 11 and 14. A leaky shot at the par-3 16th led to a poor position in a right-hand bunker and very little realistic chance at par. He made bogey there before a par-par finish that could have been a punctuation mark on the 18th going into the weekend. With the slower fairways from the rain, Tiger might have been a little too conservative, way too many long irons into greens today. Not enough confidence with the driver. After a filthy little drawing stinger off the tee, Tiger pured his approach to eight feet but narrowly missed the birdie. The shot -- a sky-high rainmaker to a perfect distance -- was his best of the day and worthy of the clubhouse backdrop that framed it. The putt, however, was not. All in all, the 1-over stretch run over the final four holes was solid considering they were playing as four of the five toughest on the course. The good news for Woods is that he'll play the weekend at a major championship. That's rarely happened in the last five years, and this will be just his fourth major weekend since the end of 2013, when he won the PGA Tour Player of the Year award. The bad news is that he's staring up at golfers like Brooks Koepka (-1), Rory McIlroy (-4), Tommy Fleetwood (-5) and Zach Johnson (-6). Could he usurp all of them (and their eight major wins) to play his way into contention with a massive Saturday round? Sure, he could, but it's not likely. This has been the story of Woods' season. He looks phenomenal at times in various facets, but he's not quite sharp enough all around to truly contend or win. This was epitomized by both his 18th hole as well as the bookend par 3s on this course. On the first par 3 -- the 8th hole -- Woods took on a tucked flag and hit a marvelous iron shot for an easy par. On the last one -- the 16th -- he dumped one in a bunker, had a lot of room to work with despite a tough spot and didn't get get it to within 8 feet. It was more of the same at the last. A masterpiece of an approach followed by hanging the putt out to the right side. There wasn't enough consistency over the first two days, of which he has been a paragon when he's gone on to win these majors. 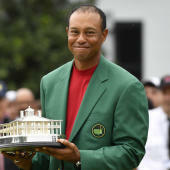 Woods will likely once again flirt or pretend to flirt with a lead early on Saturday or Sunday, but I haven't seen a sharp enough game from him over the first 36 holes to think he can make any kind of real run at major No. 15.